Geoff Johnson VetMB MA MRCVS VetMFHom RSHom PCH trained in veterinary medicine at Cambridge University and practised conventional veterinary medicine for 8 years before realising that “I merely controlled their symptoms with drugs.” He now has a homeopathic practice and vet surgery, in Somerset, England. He is a member of the Faculty of Homeopathy, the professional body for medically qualified homeopaths, and gives lectures to the Society of Homeopaths UK. 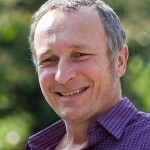 A Sensation homeopath, renowned for his dynamism, he lectures on the Bristol Homeopathic Hospital Academic Department's 4 year training for doctors and vets; and teaches Element Theory and Sensation homeopathy at the School of Homeopathy.